◆ Durable and Safe for your Pets: Made from durable High density durable nylon fabric, nickel fittings are rust-proof. ◆ Adjustable Length: the length of the belt with simple pull can be adjusted within a range from 21 to 31 Inches / 53.3 to 78.7 cm. ◆ Universal Buckle: The belt clip width is 2.1 cm, can be snapped on universal buckles.Please check your buckle's size and compatibility before purchasing. 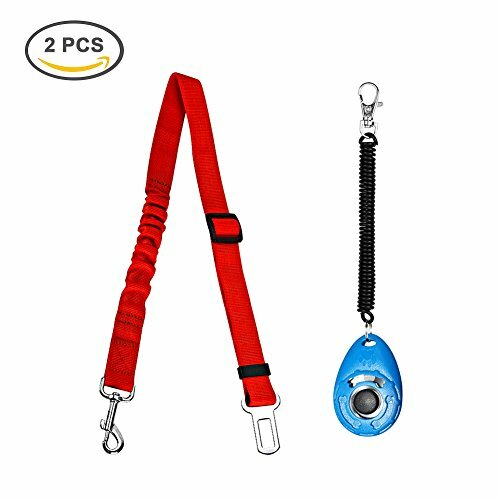 ◆ Protective Car Seat Belt: Flexible nylon fabric bungee with buffer damping design could protect your dog from sudden brake and turns. ◆ Free Gift and Warranty: To appreciate your purchase, we are offering a dog clicker completely FREE along with this product. Hope you like it. Love it Or Your Money Back without any reasons within 30 days, Full One Year Quality Warranty! Giveet dog seat belt is new version, with elastic nylon bungee buffer, designed to help protect you and your pet while driving. ■ Your pets is then restrained to one position in the vehicle and can only move a specified distance, designated by you, laterally closer or further from a window, in the front or rear seat. ■ So you only Focus on your drive, and don’t worry about disturbed by a wiggling, climbing dog. Use it every time you travel! ■ Besides, in order to offering a better lifestyle to your pets, Giveet give a free bonus dog clicker to all our customers. Giveet Seat Belt is made from premium nylon webbing with an advanced stitching technique. With heavy duty metal clips and reflective strips, you can rely on it for its durability and its ease of use. The adjustable lead extends from 21 to 31 inches, making it suitable for different size dogs in a variety of positions like sitting, standing or lying down comfortably while riding. 2) Please note the tether attaches to a dog collar or harness, and inserts into most vehicle seat belts.